Javelin thrower Devendra Jhajharia became the first Indian to secure two Gold medals with his feat at the Paralympics yesterday. The Athens gold-medal winner broke his own World record on the way and brought the fourth medal for the country at the Rio Paralympics 2016. Living up to the billion expectations, Indian Javelin thrower Devendra Jhajharia made a record throw of 63.97 meters here at the Olympic Stadium in Engenhao. Competing alongside two Indian athletes Rinku Hooda and Sundar Singh Gurjar, Devendra gave India its fourth medal at the Paralympics. 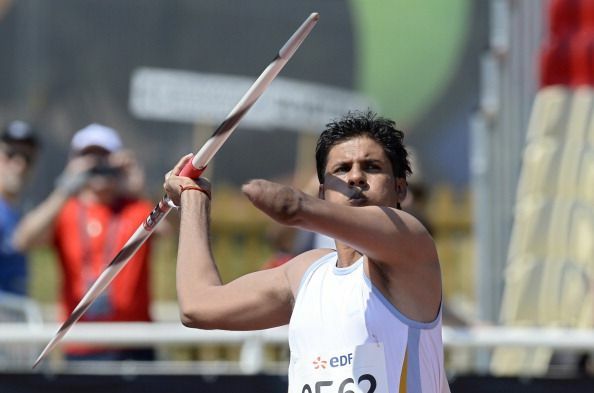 Devendra, on the way, broke his own record of 62.15m which was established in the 2004 Athens Paralympics, and by hitting a record 63.97 meters, made his way to the top of the Podium. The 36-year old Jhajharia became the first Paralympian to receive the Padma Shri award in 2012. He also received the Arjuna award in 2004. This is the fourth medal for India at Rio Paralympics as Thangavelu Mariyappan and Varun Bhati had earlier won Gold and Bronze respectively in the Men’s High Jump event whereas Deepa Malik won silver in Shot put event.